When I began my work with Bonfire, it wasn’t my first experience with content marketing. And I knew my way around most social channels (except Snapchat — I’m not hip enough for Snapchat). But I had virtually no experience with where the two merged in the constantly evolving world of social media marketing. 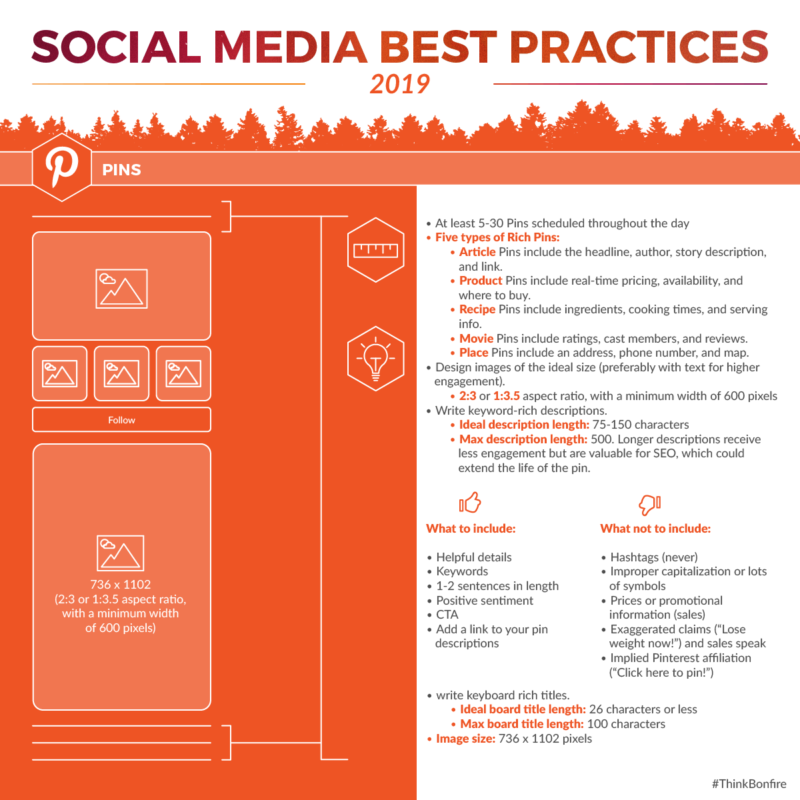 It became my goal to curate some social media best practices for our agency. How does B2B marketing differ from B2C marketing on different social media platforms? Which channels require more buttoned-up language as opposed to fun, witty wordplay? And most importantly, how much should I write for social media posts? Twitter is, of course, limited (at least for now) to 280 characters. But I could write paragraphs for Facebook and LinkedIn. What’s the character count sweet spot to boost engagement? In my research, I learned that LinkedIn is more formal B2B language, Twitter is my chance to flaunt linguistic levity, and Facebook lands somewhere in between. 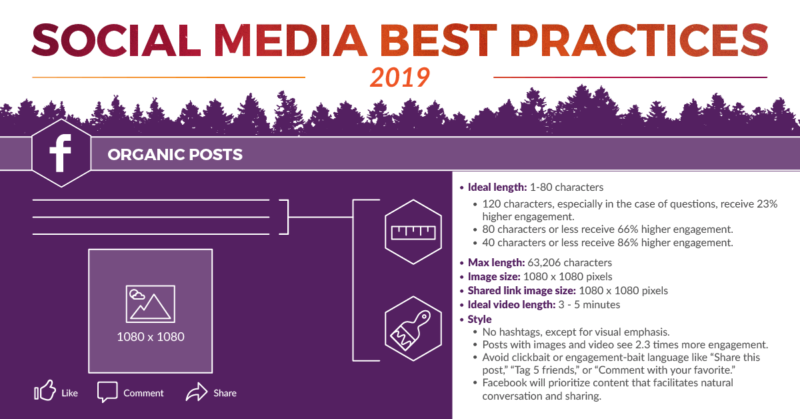 Resources abound to guide the amateur digital marketer, but none combine tips for writing, image design guidelines, and character count best practices for the posts and social ads of every prominent channel — including Instagram filter recommendations and Pinterest board best practices. It’s my pleasure to pass these best practices on to you. They’re based on our research, in-house social analytics and testing, and guidelines Bonfire has developed as part of our house style. We promise to keep it updated with the current standards as best we can. Below are some infograms to get you started on Facebook, LinkedIn, Pinterest, and YouTube. Then, for a deeper dive, check out the entire infographic for free! [Update 2019] RIP, Google+. We hardly knew thee. Video specs. 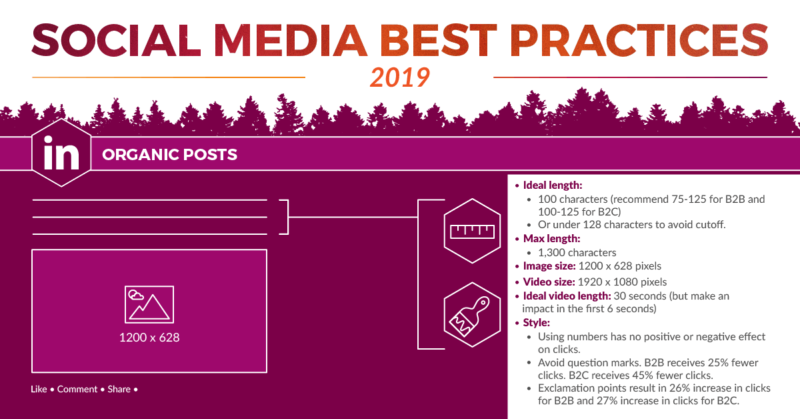 We’ve included the ideal video length and size for organic posts and ads. Video is the most engaging format across channels. Incorporate movement whenever you can. But creating video content doesn’t always have to mean professional quality. Simple, moving overlays on static images, GIFs, live video, and mobile video all fit into this category. Image specs. 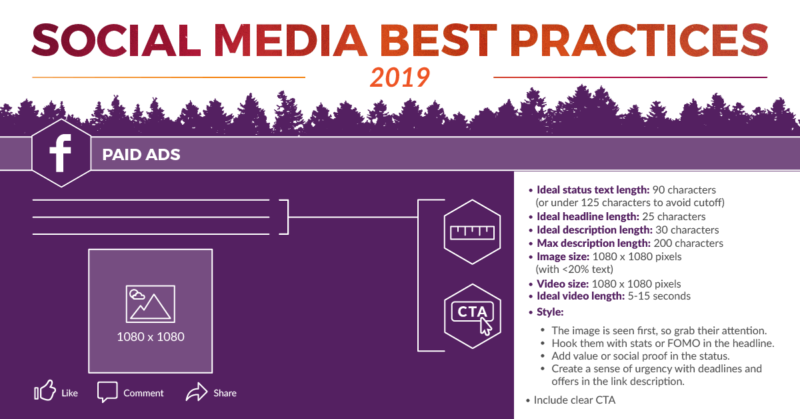 Every social media channel has its own recommendations and specifications for image and video sizes — and they seem to change at least yearly. But why do all that resizing to create so many different versions? We’ve tested a more streamlined approach to creating optimized images for each channel and found that a uniform size works for nearly all of them. Put that time to better use. Ad best practices. There are lots of nuances when creating ads for each social media channel. But we’ve tried to include those best practices that will improve your copy, video, and image creation. [Update 2018] Some big changes came to Twitter and Facebook in the past year. Twitter’s character limit boost from 140 characters to 280 characters sent social media gurus in a tizzy over how it might affect user experience with social feeds. What would it mean to have so much more content to digest? Turns out — besides giving loudmouths who shouldn’t talk more the opportunity to do so — the average Twitter user doesn’t care. Just two months after launching longer tweets, only 5 percent of users exceeded 140 characters and 2 percent exceeded 190. Roundup tweets of industry news can provide multiple links and digestible, shareable snippets for quick insights. List posts do well for blogs, so why not for Twitter? Everybody loves a listicle. Humor used effectively, whether by self-aware sarcasm or extra room for puns, ups your chances of eliciting a fast viral sensation. Emoji/emoticon tweets attract the eye. The added benefit of being vertical means your tweets will take up more of the feed. Real-time customer service can help you better explain company updates or more thoroughly assist customers. Mark Zuckerberg’s New Year’s resolution was to fix systemic issues with Facebook in the wake of abuse and hacking. 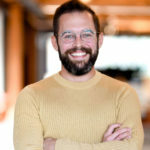 While he’s at it, his ultimate goal is to make the platform a safe space to better connect with family and friends. To that end, Zuckerberg announced that Facebook’s News Feed would begin prioritizing content that sparked authentic conversations and meaningful connections. But that also means brand page content could suffer in performance. Clickbait and engagement-bait language asking for shares, tags, or comments will be penalized. Posts that naturally elicit meaningful conversations, like local news and events. Public content that garners lots of comments (as opposed to passive likes and shares) using video, GIFs, or images without outbound links. If you’re a marketer, keep your clients in the know about what this could mean for their social metrics. Social calendars should reflect these changes by sharing fewer outbound links, with a goal of keeping users on the platform. Brands’ cost per like (CPL) could also see significant increases, while reach, video watch times, and referral traffic decrease. [Update 2017] No social media best practices would be complete without acknowledging America’s most watched platform, YouTube. With more than 1 billion hours of viewership every day, how does your channel stand out? By creating SEO-optimized video and channel titles and descriptions. [Update 2016] As of September 2016, attached media on Twitter — photos, GIFs, videos, polls, and quotes — no longer counts toward your 140 characters. However, this does not change our recommendation to keep tweets between 120 and 130 characters. Keep Facebook posts between 1 and 80 characters. Facebook posts under 40 characters receive up to 86% higher engagement. If you must go longer, try not to exceed 120 characters, especially when posing a question. Questions actually perform well on Facebook; they prompt discussion among your customers. Though hashtags are fun, they don’t do anything for engagement or metrics on Facebook, so keep them to a minimum and use them for visual emphasis only. Posts with video see up to 58% more engagement. Clickbait or engagement-bait language, like “Share this post,” “Tag 5 friends,” or “Comment with your favorite,” will be penalized in the News Feed. The ideal video length for Facebook is three to five minutes. The ideal image and video size for Facebook posts is 1080 x 1080 pixels. To boost engagement, keep the paid ad status text around 90 characters. Be sure to create a clear CTA using urgent verbs and language of exclusivity. Keep the most important content up front. The link headline should be no more than 25 characters. An ideal link description is 30 characters to optimize for mobile. The link description should not exceed 200 characters. 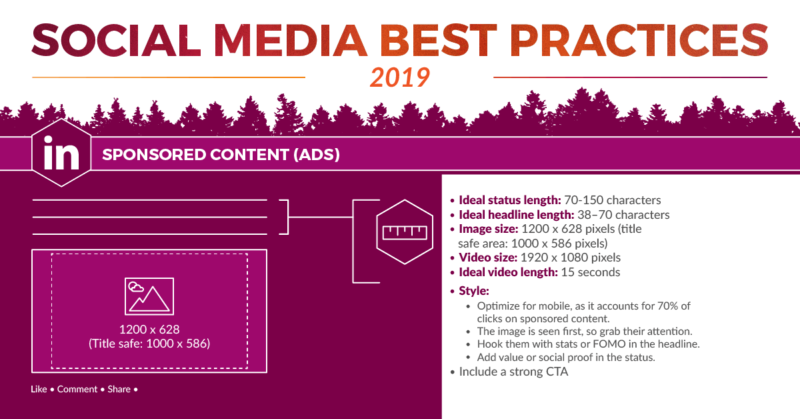 The ideal image and video size for Facebook paid ads is 1080 x 1080 pixels with less than 20 percent text. The image is seen first, so grab their attention. Hook them with stats or FOMO in the headline. Add value or social proof in the status. Create a sense of urgency with deadlines and offers in the link description. Your writing should change based on your audience. When speaking to a business audience, keep posts between 75 and 100 characters. A consumer audience is more likely to engage with a status of 100 to 125 characters. Keep your status below 128 characters to avoid cutoff across platforms. Avoid question marks; exclamation points perform better. The ideal image size for LinkedIn posts is 1200 x 628 pixels. The ideal video size for LinkedIn posts is 1920 x 1080 pixels. LinkedIn says that up to 70 percent of clicks on sponsored content come from mobile, so it’s best to optimize your posts for it. To avoid a status being cut off across all platforms, keep it under 70 characters. Use “you” statements or data to entice readers. Question marks perform 25 percent less for B2B and 45 less for B2C, perhaps because they come across as too salesy. Exclamation points actually perform better. Link headlines should include a strong CTA. Updates to LinkedIn sponsored content do not require a link description. 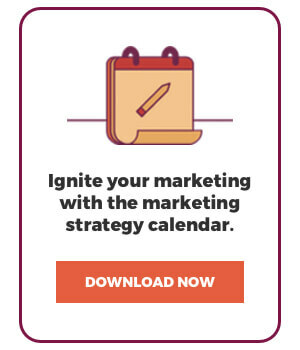 The ideal image size for LinkedIn sponsored posts is 1200 x 628 pixels. The ideal video size for LinkedIn sponsored posts is 1920 x 1080 pixels. The ideal title board length is fewer than 26 characters. Write keyword-rich board description between 75 and 150 characters. Longer board descriptions receive less engagement, but can be valuable for SEO and extend the life of the Pin. Never include hashtags, excessive symbols, prices or promotional sales info, exaggerated claims, or implied affiliation with Pinterest in descriptions and Pins. Pin between five and 10 times throughout the day. The five types of Rich Pins include Article Pins, Product Pins, Recipe Pins, Movie Pins, and Place Pins. The ideal image size for Pinterest Pins is a vertical image (2:3 or 1:3.5 aspect ratio) of 736 x 1102 pixels. 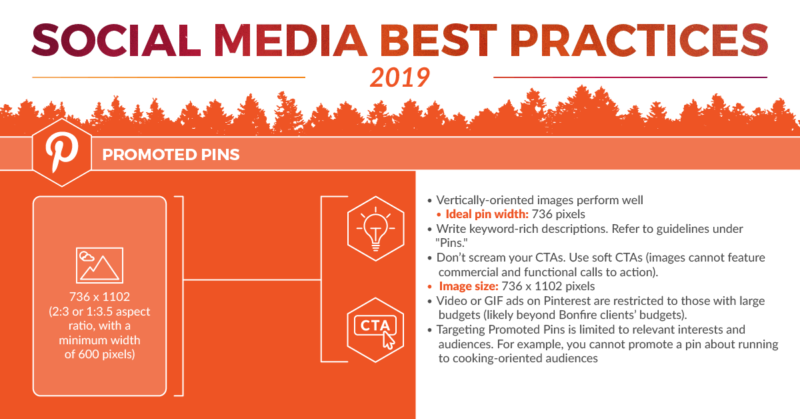 Pinterest is the one platform where vertical images perform better (specifically for Promoted Pins). Keep your Promoted Pins geared toward audiences with relevant interests. For example, don’t promote a Pin about gardening to an interior decorating audience. CTAs should be kept to one or two keyword-rich sentences with a positive sentiment. The ideal image size for Pinterest Promoted Pins is a vertical image (2:3 or 1:3.5 aspect ratio) of 736 x 1102 pixels. The ideal video length for YouTube is between 16 seconds and two minutes. YouTube video titles should use around 70 characters to adequately describe the contents of the video. Write keyword-rich video titles and descriptions. The video description should include URL(s) to your website and/or social media channels, a strong CTA, and a link to subscribe to your channel. Monday–Wednesday: 11 a.m.–1 p.m. PST. Thursday–Friday: 9 a.m.–12 p.m. PST (best days for the most viewership). Saturday–Sunday: 6 a.m.–8 a.m. PST. Creating subtitles for your videos could boost traffic by up to 19 percent and audience retention by up to 12 percent. Forty percent of videos are viewed on mobile, so keep them mobile-friendly. 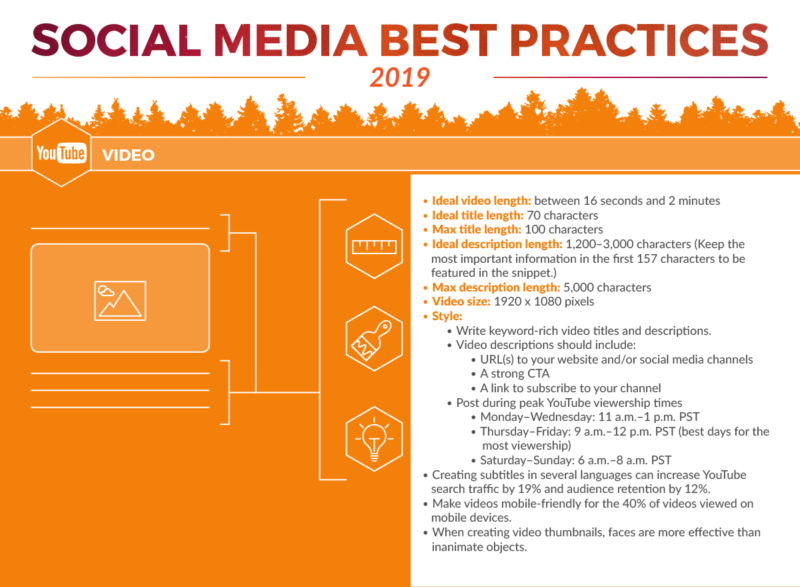 You can view the entire infographic or download a copy for the office to receive guidelines for the rest of the social channels. We hope you use these best practices in creating your own house style guide and simplifying training for your writers and designers on the current standards of every channel. I can’t download the infographic guidline – can you help me? Hi there! Thank you for reaching out. The infographic is now downloadable. Please let us know if you’re still having trouble!